It’s almost Easter and many children and adults alike are looking forward to a great excuse to indulge. Chocolate is usually thought of as a tempting but very unhealthy treat, but is it really as bad as all that? Chocolate is made from the beans of the cocoa plant (Theobroma cacao). These contain a group of compounds called flavonoids, which act as antioxidants, helping to prevent cell damage, and thus providing a degree of protection against cardiovascular disease. A study published in the European Heart Journal found that consuming chocolate lowered blood pressure and helped to reduce the risk of heart attack and stroke. Chocolate is also very rich in magnesium. This important mineral increases energy levels, helps to prevent heart irregularities and muscle cramps, assists in calcium absorption, and is essential for healthy nervous system functioning. 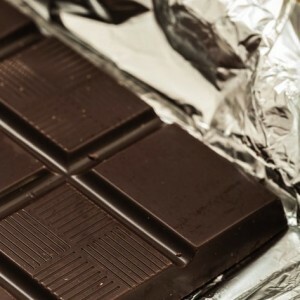 People who experience chocolate cravings often find that these can be reduced by eating other magnesium-rich foods (such as whole grains, nuts and dark green leafy vegetables) or by taking a magnesium supplement. Cocoa beans contain a fat known as cocoa butter. This can be used as a soothing skin moisturizer, which is effective in preventing wrinkles and stretch marks. It melts just below body temperature and is therefore easily absorbed and can also be used as a base for herbal suppositories and pessaries. On the down side, chocolate contains large quantities of oxalic acid, which can exacerbate joint problems such as rheumatoid arthritis and gout. The acidic effect in the body is also detrimental to other inflammatory conditions such as acne and psoriasis. A more alkaline alternative is carob, a chocolate substitute that is widely available from health food stores. The uplifting effect of chocolate is partly due to the sugar content and partly due to a caffeine-like substance called theobromine, which has a stimulant effect. However this initial boost is quickly followed by a sharp dip in blood sugar levels. The inevitable consequence is a craving for more chocolate, for another hit. Anyone who has attempted (successfully or otherwise) to give up chocolate for Lent will testify to its addictive quality! Over time, excessive chocolate intake can lead to excessive weight gain and depleted energy stores, and in young children it may be partly responsible for the increasing occurrence of hyperactivity. Unfortunately most of the chocolate that is readily available in the shops contains higher amounts of sugar and milk than of cocoa. These contribute to conditions involving excessive mucus production such as sinusitis and asthma. Excessive sugar consumption also increases the risk of diabetes and other health problems. In order to benefit from the more positive attributes of chocolate and to minimise the detrimental effects, choose a good quality dark chocolate which contains at least 70% cocoa, such as O’Conaill, Green & Blacks or Lindt and remember: all things in moderation! Most people have, at some time or another, experienced acid reflux, or ‘heartburn’ as it is more commonly known. For many people this is just an occasional discomfort, caused by eating too much rich food. However, for individuals who suffer from Gastro-Esophageal Reflux Disease, or ‘GERD’, acid reflux is a constant problem which can cause a great deal of pain and distress. When we eat, the stomach secretes acid, enzymes and other substances, which help to break down food. The lining of the stomach is uniquely designed to resist the corrosive nature of these substances. Under normal circumstances, a band of muscle at the top of the stomach, known as a ‘sphincter’, prevents reflux of stomach contents into the esophagus (the tube connecting the throat to the stomach). However, in some people, this sphincter becomes weak, and the stomach contents flow back up into the esophagus. This often affects babies due to an under-developed digestive system, and pregnant women due to hormone changes that affect muscle tone. Obesity and structural abnormalities of the gastrointestinal tract such as hiatus hernia can also contribute to acid reflux. Reflux of stomach acid into the esophagus leads to symptoms such as a burning sensation in the chest which is usually worse when bending or lying down; pain or difficulty swallowing; chronic hoarseness or cough; a sour taste in the mouth; bad breath; and excess production of saliva (waterbrash). The lining of the esophagus is not designed to resist the acid contents of the stomach, and repeated exposure can therefore cause inflammation (esophagitis). In severe cases, erosion of the esophageal lining by stomach acid may lead to the development of an ulcer. In some people a tightened or narrowed area of the esophagus (known as a stricture) may develop which can lead to pain and difficulty in swallowing. Chronic inflammation due to acid reflux may also trigger the cells lining the esophagus (which are not designed to resist acid) to mutate and become more like acid-resistant stomach cells. This condition is known as Barrett’s Esophagus, which may lead to the development of cancerous cells. It is therefore extremely important for anyone who regularly suffers from heartburn or any of the other symptoms of GERD to consult a medical herbalist or GP. Orthodox treatment for GERD usually consists of a type of medication known as a proton pump inhibitor (e.g. omeprazole) to reduce the production of stomach acid. This is usually effective in controlling the symptoms and reducing the incidence of inflammation and other complications. However, the problem with GERD is not one of too much acid, but rather the presence of acid in the wrong place. Acid is required in the stomach for proper digestion of food and to control harmful bacteria. Long-term use of medication to reduce the production of stomach acid does not cure the underlying disorder, and may lead to a disturbance in the microflora of the digestive system, and decreased absorption of a variety of vitamins, minerals and other important nutrients, such as Vitamin B12, Vitamin C, Calcium, Magnesium and Iron. This can lead to an increased risk of serious infections, such as pneumonia and Clostridium difficile, and increased risk of osteoporosis and bone fractures. Recent studies have also shown that long term use of proton pump inhibitors is also associated with an increased risk of Alzheimer’s disease and heart attacks. Fortunately there are more natural ways of treating GERD, which are both safe and effective. First of all it is important to avoid any foods that trigger the problem. These vary from person to person, but common culprits include acidic foods such as oranges and tomatoes, fatty foods, onions, chocolate, coffee and alcohol. Gluten intolerance is also a major cause of GERD and I have had many patients who were able to come off long-term medication and remain symptom-free after switching to a gluten-free diet. Avoid eating very large meals, which increase the pressure in the stomach, and opt for smaller, more frequent meals instead. Try to sit upright after meals until the food is digested and avoid slouching on the sofa, or eating a large meal at bed time. Likewise, bending and lifting may lead to worsening of symptoms and should be avoided after eating. It may be helpful to raise the head of the bed so that the esophagus is higher than the stomach. Herbal treatment of GERD usually includes demulcent herbs such as marshmallow root, which helps to soothe and protect the lining of the oesophagus. Liquorice root is another soothing herb, which helps to reduce inflammation and promotes the release of substances that protect the tissues of the gastrointestinal tract. Calamus root helps to increase the tone of the oesophageal sphincter, and thus prevents reflux; while meadowsweet is a natural antacid, which also helps to protect the lining of the oesophagus, reduce inflammation, and prevent cell mutation.